"Members of the Wakefield High School Drum Corps were most likely a part of the Wakefield High School Cadets. Due to the large number of young men who participated in this battalion, two Companies were formed: Company A and Company B. Officers are the young men in the front, differentiated by their uniforms (covered buttons) and swords. The Wakefield High School Cadets had its beginnings in 1885 when the group entered the Second Massachusetts School Regiment, forming a battalion with the Reading and Andover Cadets. Among its activities were annual prize drills, exhibition drills and officers' parties where 'many out-of-town officers and cadets enjoyed their hospitality.' They also escorted the Grand Army Post each May, and on the day of a big baseball game, the Drum Corps escorted the opposing team from the street railway to the Common, where the games were played. Crowded conditions at the high school in 1931 meant the end of the Cadets, although it was reinstituted during World War II, and required of all young men in the junior and senior classes." -- Text from calendar by Jayne M. D'Onofrio. 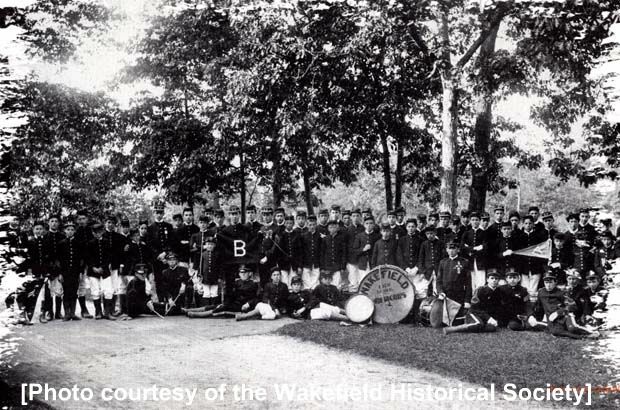 “Wakefield High School Drum Corps, 1900,” NOBLE Digital Heritage, accessed April 22, 2019, https://digitalheritage.noblenet.org/noble/items/show/7132.